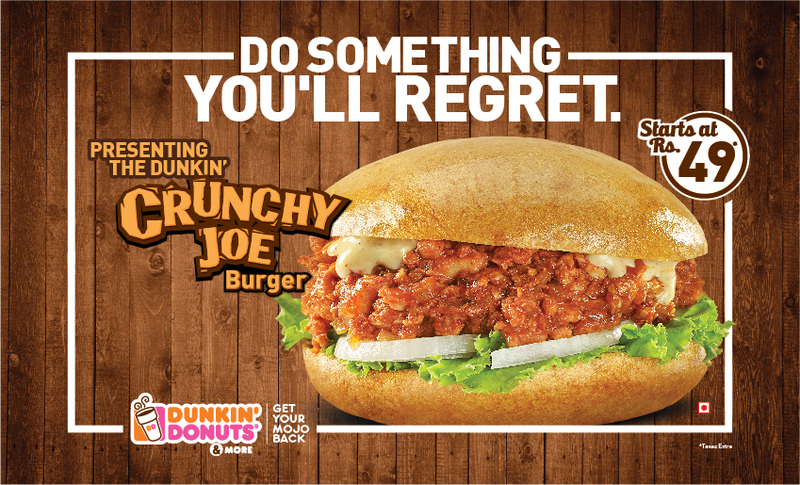 Quite recently Dunkin Donuts launched its new Crunchy Joe burger. Oh for a person like me something new is something I want! They paint a really nice picture of the burger in your head, with the crunchy glossy bun and the melt in your mouth filling. Umm… So yum! I finally couldn’t resist the urge anymore and so I went and ordered one for myself. Being a vegetarian, my burger looked nothing like the non-veg burger in the poster, which should have come as a relief but rather made me feel guilty for being a vegetarian. The most interesting part of this entire thing is that they’re promoting the burger with a tag line saying “Do something you’ll regret”. Now this made no sense at all at first, but one bite into it and I knew exactly what they were talking about. It’s like the tag line was written just for me because the only thing going on in my mind was ‘I’m being fined for all the sins I’ve done up until now’. One thing I’ve learnt from this incident is to really look into what the brand is telling you and take the good advice. If it says you’ll regret this, then rest assured you most definitely will!